A speaking portrait will often live in the remembrance of the people, and serve to retain the memory of early pioneers, far more than any written description of themselves, their lives and their labors. To the historian, paintings provide clues about the activities, attitudes, ideas, interests, prejudices, and status of the people who made and used them. 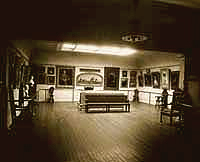 The Wisconsin Historical Society recognized the importance of visual works of art as documents of history and began to commission and collect paintings in 1854. Today, the Society maintains a significant painting collection that is rich with historical evidence. But just what kinds of evidence do paintings offer? How do we make sense of the information they provide? How do we frame them within their historical context? Join the investigation and discover the stories behind the canvas.